I grew up in a time when there was a threat of weapons of mass destruction, an unpopular war in a far-away country, economic uncertainty, and violence amongst our people. I was influenced, as a child, by John F. Kennedy, who as President dared us to do what we could only dream. As the years have passed, I am now more greatly influenced by another noble man, the most eloquent and articulate spokesman of peace and justice and one of the most courageous Americans of our time: Rev. 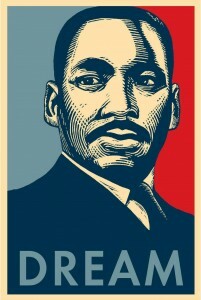 Dr. Martin Luther King, Jr. He dared us to dream of what we could collectively be. His messages are as vibrant, powerful and meaningful today as they were nearly 50 years ago. His life has special impact for me and every American, for he helped to free us of the illusion that we can somehow lift ourselves up by holding others down. He filled a great void in our nation, and answered our collective longing to become a country that truly lives by its noblest principles. He spoke to me when he preached that the yoke of oppression shackled the oppressor as well as the oppressed. He realized that oppression was more the result of a culture afraid of change than the result of hatred, and that the hearts and minds of well-intentioned moderates were more important to change than the actions of extremists. He knew that a country could not truly be great when it did not live by its professed values, nor could any country truly be free when any of its people were not provided the freedoms and opportunities of the most privileged.